Previous Chicago to Las Vegas coverage. Now that the show is over we can continue to report on more of the tools and mobile computing gear that helped us survive the technical journalist's ultimate extreme sport, Fall Comdex 1999. We last took a hopeful first look at the ORB at PC Expo in June and had great expectations for this 2.2 GByte removable media drive. Now that we've gotten our hands on one and tried it under the "battle conditions" of Comdex, it is clear that the ORB is well suited for the backup and data transfer tasks that were required of it during the show as we frequently shuttled high resolution images around between cameras, laptops, and archival media. 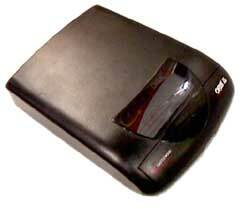 We can't tell you if Kingston's Solid State Floppy Disk Cards retain data for the 10 years that they claim. But, now that flash memory (like the SSFD) has all but supplanted film in the web journalist's camera bag, this new "film " had better be reliable enough to get our images back to our digital darkrooms in pixel-perfect condition. 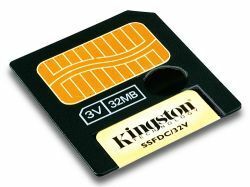 Kingston's 32Mb SmartMedia card proved it could do just that.Think of it as an infinitely reusable roll of film that never degrades for $112. USB equipped digital cameras are a great advance over older models with serial port jacks for downloading images since they are faster. But, truth be told, USB downloads from some digicams don't even begin to tap into USB's bandwidth. One solution for both old and new cameras using SmartMedia or CompactFlash media is Antec's PhotoChute ($119.00 msrp). It blasts data to your PC's or laptop's USB port at five times the rate most USB cameras can muster or fifty times the rate of serial port transfers. That results in faster reloads between photo shoots or just quicker turn around when you've got to review your images on a tight deadline. Copyright © 1999 Stephen R. Jones All rights reserved.